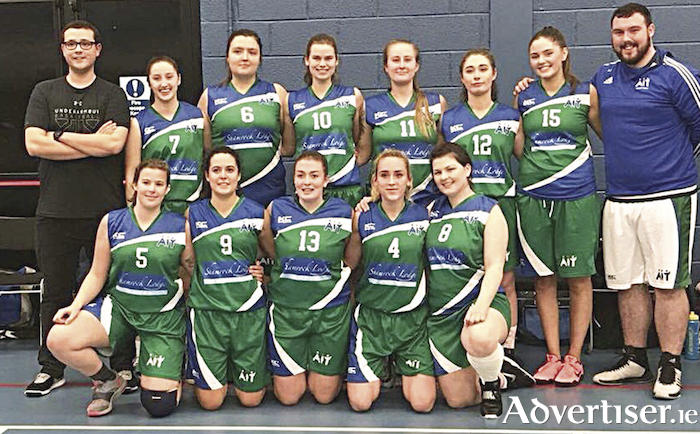 AIT Ladies basketball team continued their undefeated winning streak with a comprehensive win over Garda College. Although a depleted squad made the long journey to Thurles, the team came away with their fifth win of the competition without defeat. Despite missing two members of their usual first five due to academic commitments, a rejigged AIT did not let this get in their way. Amy McTeggart and Emma Fagan started strongly with a series of well executed fast break scores. Bridget Gleeson and Katrina Sucic dominated the defensive boards, restricting their opponents to one-shot opportunities. Ilaria Gandini was also setting the defensive tone, pressuring her opponent into committing a number of turnovers. This defensive intensity was maintained for the first half, with AIT leading at the half way point by 33 points to 2. In the second half, demonstrating the strength of their squad, other players stepped up. Hayley Jones was a tower of strength under the boards. Lorette Grimaullt continues to go from strength-to-strength each week, and demonstrated the finesse of a seasoned veteran with a number of outside scores. Niamh Fleming tormented the Garda offence with a number of well-timed steals as she drove the full court for easy scores on the offensive end. The game finished with a comprehensive 43 point win for AIT. The men’s squad had mixed results in the club league. An out of sorts team were easily beaten by Longford Torpedoes, who now top the table going into the Christmas break, while a diary mix-up led to AIT making the long journey to Sligo to find out there was no match. AIT was awarded the points due to this unfortunate event. As both teams finish up for the Christmas break and concentrate on their academic exams, they find themselves in a good position heading into the New Year.